Soak up the North Carolina sunshine with a variety of outdoor activities, because summer is finally here. The blue ghost firefly is a secretive insect that calls the mountain forests of North Carolina home for a short time each summer. Learn more about them and other nocturnal creatures on a family-friendly walk through the dark with a trained naturalist. A naturalist will be your guide on Grandfather Mountain as you learn about the beauty, significance, and cultural history of the native rhododendron. Learn more: (828) 733-2013 or grandfather.com. Attend a meet-the-artists reception on Friday, and tour art galleries at this semi-annual studio tour of Mitchell and Yancey counties. Photographers of all skill levels are welcome at this Grandfather Mountain event, which will feature presentations by top nature photographers and an opportunity to test new photo skills in the beautiful surrounding landscape. Registration is required. Buncombe County Master Gardeners will host a self-guided tour of six private gardens in Asheville. Learn more: (828) 255-5522 or buncombemastergardener.org. This 10th annual classic car show will feature driving events on the surrounding mountain back roads, and live music. Learn more: (828) 526-5841 or highlandsmotoringfestival.com. This 11th annual family-friendly music festival will be held at Fiddler’s Grove Campground, and will feature live music by nearly 25 local and regional bands; art and craft vendors; food and beverages; and on-site camping. Browse a wide variety of handmade art, and talk to the artists and craftspeople who specialize in everything from fine art to woodworking. Learn more: (828) 862-8122 or facebook.com/thcguild. In addition to local produce and baked goods for sale at this farmers market, held every Saturday from May to November, there will be a cooking demo by a local chef, a kids’ corner with a mini market, and live music. Learn more: (828) 355-4918 or wataugacountyfarmersmarket.org. This 20th annual festival at the Museum of the Cherokee Indian will celebrate the vibrant art forms of the Cherokee culture, such as dance, music, storytelling, and arts and crafts. Learn more: (828) 497-3481 or visitcherokeenc.com. Enjoy performances of old-time music and ballad singing, as well as art vendors, food, and more. The festival originally started to help prevent logging on Bluff Mountain. The proceeds from the festival now benefit the Madison County Arts Council. Learn more: (828) 649-1301 or madisoncountyarts.com. Grandfather Mountain is throwing a birthday party for all of the animals in its wildlife habitats: The celebration will include games, contests, crafts, and surprises for guests. Grab your kilt and head to the 20th annual Scottish heritage festival. Held every Father’s Day weekend, it features a parade; border collie herding demonstrations; and Scottish musicians, dancers, fashion, games, crafters, and more. Learn more: (727) 424-8901 or tasteofscotlandfestival.org. The historic weaving and woodworking complex of Biltmore Industries, now known as Grovewood Village, is celebrating its 100th anniversary with weaving demonstrations, art displays, and history tours. Sounds of guitars, bass fiddles, and banjos will fill downtown streets at this festival, which will feature entertainment, food, and more than 50 vendors selling handcrafted goods. Learn more: (828) 586-3511 or dillsboronc.info. Bear W Daylily farm will be filled with good food and bluegrass music by the Good Ole Boys during this annual festival of the flowers. Learn more: (828) 584-3699 or bearwdaylilyfarm.com. The American Association of University Women will host this 48th annual book sale to benefit scholarships and support for young women. There will be 20,000 gently used books covering every genre and topic. Learn more: (828) 885-8245 or brevard-nc.aauw.net. The Blowing Rock Garden Club will host this tour of the private gardens of downtown churches and homes. Guides will provide information about plants; a garden-themed boutique and afternoon tea will wind things down. More than 80 art events — including the opening of the Brevard Music Center, street dances, music, a live radio show, and more — will culminate in a Fourth of July celebration and fireworks. A dozen top gospel groups will perform at MacRae Meadows at Grandfather Mountain. Returning for its 93rd year, this all-day event also features a sermon. Catch a performance of this classic Shakespeare play at the 1897 Poe House, a museum of the Cape Fear Historical Complex. This production is by Sweet Tea Shakespeare, a theater company that seeks to make the playwright’s most famous works accessible and inspiring to the community in beautiful spaces. This annual downtown festival features craft and food vendors, a car show, kids’ activities, a barbecue chicken cook-off, and live entertainment. It begins with a street dance on Friday night. Learn more: (919) 606-5167 or bcaserves.org. Jam out with a cold one: There will be more than 100 beers from more than 20 breweries at this 15th annual event, which also features live blues music, local food vendors, and games. Test your survival skills at the third annual Archaeolympic Games at the Town Creek Indian Mound State Historic Site. The event celebrates archaeological-themed skills and games, like fire making, atlatl spear throwing, and weaving. More than 35 wineries from around the state will gather downtown to share samples at this 12th annual festival, which exclusively serves North Carolina wine. Learn more: (336) 354-1500 or salutencwine.com. See performances from a variety of funk, jazz, and blues bands in Clayton Town Square. This music festival, which also features arts and crafts vendors, is all about celebrating diversity and empowering the community. Learn more: (919) 971-6800 or mondoroots.com. Begin (or add to) your pottery collection at this special art event at Bulldog Pottery. Meet the potters and browse works while enjoying light refreshments. Learn more: (336) 302-3469 or cousinsinclay.com. Tour six private gardens near High Rock Lake at this 13th annual garden tour hosted by the Davidson County Extension Master Gardeners. Learn more: (336) 210-5365 or davidson.ces.ncsu.edu. The 10th annual Farm to Fork Picnic in the Fearrington Barn will feature up to 35 chefs, who will each create tasting-size dishes using seasonal ingredients grown by a local farm they are paired with, resulting in delicious, creative collaborations. Learn more: (919) 260-5198 or farmtoforknc.com. This four-man string band performs songs from Charlotte’s heyday as a hub for country and gospel music recording — the roots of what’s now known as bluegrass. Learn about the history and culture of the Catawba Indian Nation during this symposium at the Charlotte Museum of History. Preregistration is required, and lunch is included. Six private homes will open their gardens for tours, and one will feature master gardener demonstrations. Learn more: (336) 786-8745 or eventbrite.com. Ahoy! A pirate encampment, cannon and sword demonstrations, and artisan crafters will be at Harrison Park to delight kids, Jack Sparrow wannabes, and history buffs alike. Learn more: (336) 859-4231 or townofdenton.com. Be sure to bring chairs and blankets for this evening performance by the North Carolina Symphony on the Village Green at Southern Village. Learn more: (919) 933-4422 or southernvillage.com. Learn about the history of the China Grove Roller Mill, and the many people who helped create its lasting legacy. Visit the mill for a short history talk and discussion with refreshments. Forty-eight teams from across the country will compete in this cookoff, sanctioned by the Kansas City BBQ Society. The festival also features pig races, a beer garden, live music, and, of course, plenty of barbecue. Learn more: (919) 608-0209 or peakcitypigfest.com. You don’t have to wait until October to get spooky: Join professional ghost hunters on the grounds of the 200-year-old Historic Rosedale Plantation as they attempt to contact ghosts with the latest technology. Learn more: (704) 335-0325 or historicrosedale.org. This festival at the U.S. National Whitewater Center will feature morning yoga and a 6K trail race, beer tastings from local and national breweries, and live music. Learn more: (704) 391-3900 or usnwc.org. The Davidson Community Players will present this classic Broadway musical. In 1930s New York City, little orphan Annie charms everyone she meets on her journey to escape an orphanage and find a new home with billionaire Oliver Warbucks. More than 50 amateur, semiprofessional, and professional groups will appear at this outdoor gospel singing convention. One of the oldest and largest singing competitions in the U.S., it began in a tobacco warehouse in 1921. Learn about Victorian-era traditions and games while taking part in activities inside of Historic Körner’s Folly, as well on the porches and surrounding lawns. Now a 22-room museum, it was built in 1880 and served as the home of artist and designer Jule Gilmer Körner. Come hungry: There will be a variety of food trucks to fill your belly in Shallowford Square. There will also be adult beverages offered by Hoots Brewery and Medaloni Cellars, and a performance by The Big Love Band. Learn more: (336) 945-5558 or lewisvillenc.net. Head downtown for a food truck rodeo: Local musicians will provide entertainment, and food trucks and local beer and wine vendors will line the streets. If you’re an antiques addict, hold on to your wallet (or don’t): Buy, sell, or browse a wide selection of antiques at this annual festival in downtown Denton. On Friday night, listen to the band Jupiter Jones and dance under the stars; on Saturday, enjoy boat rides and paddling in Edenton Bay, food, drinks, and vendors at this annual festival, all along the edge of the water. Learn more: (252) 482-0300 or visitedenton.com. At the end of a long week, you might be ready to dance or kick back and put your feet up. You can do both at this weekly summer concert series, which will feature a variety of beach music bands like Band of Oz and The Carolina Breakers. Held at the downtown waterfront, Bear Fest celebrates black bears and educates the public. Attendees of all ages can take black bear tours in the wild — coastal North Carolina is home to the highest concentration of black bears in the Southeastern U.S. Learn more: (252) 793-6627 or ncbearfest.com. Divers, fishermen, environmentalists, and plain old ocean enthusiasts can tour The Fort Fisher, a tugboat at the U.S. Facility Dock, before it’s sunk off the coast to serve as a new artificial reef. Enjoy food, drinks, and music. Learn more: (252) 728-2265 or carolinareefs.org. Butter churning, lard rendering, wagon rides, a blacksmith, antique farm equipment, animal demonstrations, kids’ races and games, and a parade at John A. Holmes High School will help you take a step back in time to see what farm life in northeastern North Carolina was like in the past. Learn more: (252) 489-0349 or facebook.com/heritage.association1. Kayak or paddleboard a 3.2-mile route along the town’s beautiful canals and Bogue Sound. Paddle for fun or take part in the race — all ages and skill levels are welcome at this 10th annual event. Proceeds will go to Hope for the Warriors, a nonprofit that benefits wounded soldiers. Registration is required. This summer concert series takes place each Sunday evening at the Town Common, and has been a Greenville tradition since 1973. A different artist performs each week, and music varies from bluegrass to jazz to beach music to classical to rock. Learn more: (252) 329-4698 or greenvillenc.gov. In this musical comedy at the Carolina Civic Center, nuns discover that their cook, Sister Julia, has accidentally poisoned 52 of the sisters; the five survivors create a variety show to help raise money for all the burials. With assistance from the American Legion Post 10 Honor Guard, learn how to hoist and fold flags on the Battleship North Carolina. You can bring your own or purchase one on the ship. For 14 years, the state’s blueberry capital has been hosting this festival to celebrate the economic and cultural significance of the fruit. There are more than 20 events, including a street fair, recipe contest, barbecue cookoff, fresh blueberry sales, and more. Learn more: (910) 259-2007 or ncblueberryfestival.com. 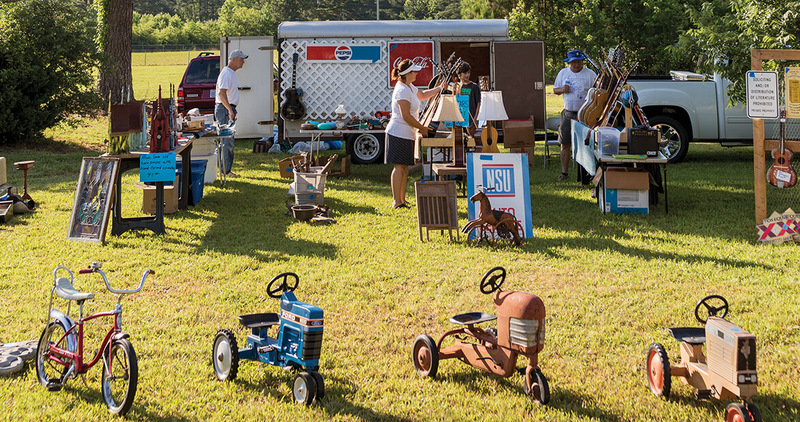 The 301 Endless Yard Sale is a mecca for flea market enthusiasts on the hunt for stand-out finds. For two days, a stretch of highway more than 100 miles long transforms into the state’s biggest yard sale — putting small towns like Selma on the map all year long. To commemorate its 20th anniversary, the Sampson County History Museum will host tours, live music, food, and pony rides. Learn more: (910) 590-0007 or sampsonhmc.com. Join local historian Jan Wessell on a tour of the angel sculptures in North Carolina’s oldest rural cemetery, and learn about the stories behind them. This art show will feature more than 30 artists and craftspeople, local music and food, live art, and more. Learn more: (443) 243-5870 or facebook.com/rockthecape. Celebrate the little blue superfood with vendors, music, water activities, and, of course, blueberries, at this Bridgeton Harbor Marina festival. Throughout its history, the town has been a go-to stop to pick your own berries.